These van roof bars are produced from high grade aluminium and each bar is tested to over 200kg which is probably more that the roof of your van could carry. Despite their incredible strength these van roof bars are very light in weight which means you are not carrying an un-necessary amount of weight everywhere you go. Clearly this won't impede on the legal carrying weight of your van and it won't reduce the fuel return either, unlike some other van roof racks. Likewise they won't rust like other van roof racks either. 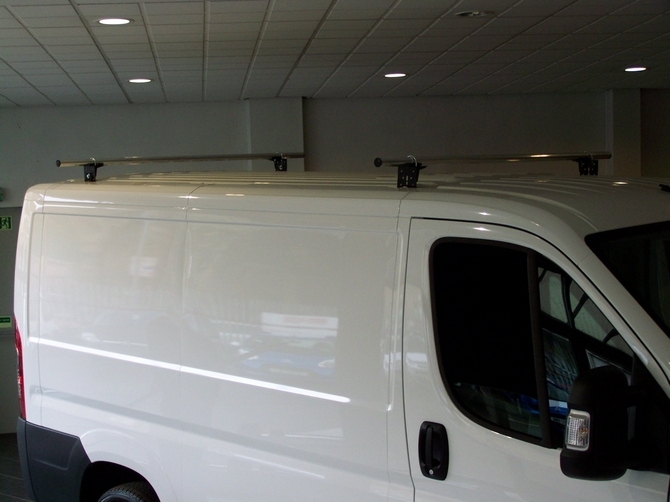 Our van roof bars are universal fitting quite a large range of vans. So now you have a van roof racking system that will carry everything you need. It won't rust and you can transfer it from vehicle to vehicle as the years go by. What's more, it can even be upgrade to a full contractor's style roof rack. This is a framework style van rack that would cover the roof of the van. This framework style van rack helps disperse even more weight. These bars are sold in PAIRS!!! and may be trimmed down to cosmetically suit the smaller midi sized vans, such as the Vivaro or T5 etc.